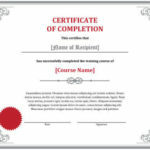 Stock certificates (aka share certificates) are legal documents that attest to the purchase of stock in a company. 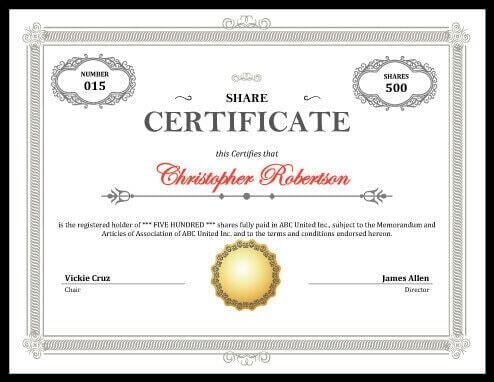 Each share certificate proves ownership in an allotment of stock—much like a receipt. Typically, a shareholder receives a paper stock certificate from the brokerage firm that handled the transfer. Shareholders may also receive certificates from the company’s transfer agent right after the share transfer. If you run, work for, or represent a business interested in pursuing investment opportunities, you’re responsible for offering stock certificates to your investors. 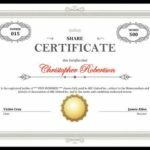 A high-quality stock certificate template makes this easy to do. If your company plans to offer shares of ownership to potential investors, all of this information will have to be compiled on a single legal document. Since investors usually don’t take physical control of the stocks they purchase, share certificates are the primary way to establish ownership. Shares in a company’s stock represent assets that back up the investment, similar to collateral on a loan, formalized in a contract between the investor and the company. As the first document referred to if an investor and stock issuer enter into dispute, the share certificate is an important document. It provides the foundation for the relationship between the company and investor. Should a disagreement go to court, this document will help determine who wins the settlement. Similarly, stock certificates give companies a fair, uniform means of determining stock ownership. As a company could have large numbers of shares on the market, share certificate templates help organize the transaction history. 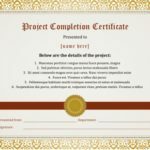 Below you’ll find free printable stock certificate templates. Stock certificates follow a simple, almost universal design, and these have been modelled after some of the best looking in the industry.